Scaffolding is a temporary rigid structure having still, bamboo or timber platforms raised up with increasing the building height. It enables the mason work at different stages of a building and takes up the materials for the immediate use at various heights. Different types of scaffolding are used depending upon the types of construction. 1. Standard: It is a vertical member supported on the ground. 2. Ledgers: Ledgers are the longitudinal horizontal members connected with standards. 3. Braces: Braces are the diagonal members that are connected with standards to stiffen the structure. 4. Put Logs: Put logs are the transverse horizontal members that are 90 cm in length and are generally spaced 120 cm apart. They are provided to support the working platform. 5. Transoms: When both the ends of put logs are connected with ledgers, it is called transoms. 6. Boarding: Boarding is a horizontal member supported by put logs. It is used to enable the mason and materials. 7. Guard Rail: It is similar to ledgers, used for a better protection at the working level. 8. Toe Board: It is a long horizontal board of wood used at the different working level. 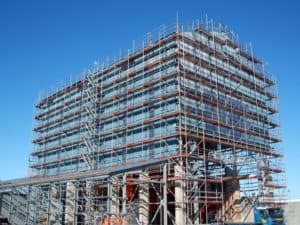 This type of scaffolding consists of standards firmly secured in the grounds at 2.4 to 3 m. The standards are connected to each other by ledgers at every rise of 120 to 150 cm. They are provided on the building side of the standards and are secured in position by rope-lashing. Putlogs are lashed on the ledgers at one end and into the holes in the wall at the other end. In high scaffolding, cross braces are invariably used to stiffen the temporary structure. Braces consist of poles tied by rope-lashing on the standards. Since it is difficult to leave holes in the stone masonry to provide a bearing for the putlogs, in mason’s scaffolding two frames of standards, at a distance of 1.5 m from the first one. Thus the mason’s scaffolding is entirely independent of the stone wall. Close mason’s scaffolding: They are supposed to carry loads of heavy blocks of stones and the stresses produced on account of the lifting device and hence they are made stronger by placing the standards at a fairly close distance apart. The construction of steel scaffolding is essentially similar to that of timber scaffolding. In this case, the wooden members are replaced by 38 mm to 64 mm diameter steel tubes and instead of rope-lashings, special types of steel couplets or fittings are used for connecting different members. The steel tubes used for scaffolding for normal building construction work are heavy class and of diameter varying from 40 to 60 mm. In this type of scaffolding, the vertical tubes called uprights or standards are spaced 2.5 to 3 m apart. Each standard is welded to a base plate, square or circular in plan. The base plate has holes so that it can be spiked to a timber or concrete base, thus forming a rigid foundation for the scaffolding. Ledgers or the longitudinal tubes connecting the standard and are spaced at 1.8 m vertically apart. Short tubes or put logs are normally 1.2 m to 1.8 m in length. The putlogs have special ends to fit into the joints in the wall and thus no big holes are required to be left on the wall for their bearing. Tubular scaffolding has several advantages over the timber scaffolding such as rapid erection and dismantling, greater strength and durability, higher fire resisting qualities and salvage value. Although it works out to be costlier initially, but considering its several advantages and the increased number of reuses, it proves to be economical in the long run and hence it is being extensively used these days. Tubular scaffolding mounted on wheels can be used for carrying out the work of painting the walls, underside roofs etc. When scaffolding is to provide for a building on the side of a busy street where the construction of ordinary scaffolding will obstruct the traffic on road, needle scaffold is used. The scaffold is erected from window corners of string courses by means of projecting needles. A needle is a timber beam which cantilevers out through the holes cut in the wall. From inside the needles are supported on sole pieces and are prevented from lifting up by vertical struts wedged between the needles and the headpieces. The projected end of the needle is supported by an inclined strut which rests on the window sill. The joint between the raking or inclined strut and the needle is clamped by mean of dogs. The arrangement provides the staging for the erection of ordinary type of scaffolding. I didn’t realize that there could be different types of scaffolding, but it’s good to know that there is something for each situation. The mason scaffolding in particular stood out to me, especially since it’s entirely independent of the stone wall. I’d be interested in learning more about the history of scaffolding now, especially to see the development of it to where we are now.